Here are some questions I immediately asked myself, followed by the answers I feel are correct. Q: Should we be offended by this Holocaust tweet? 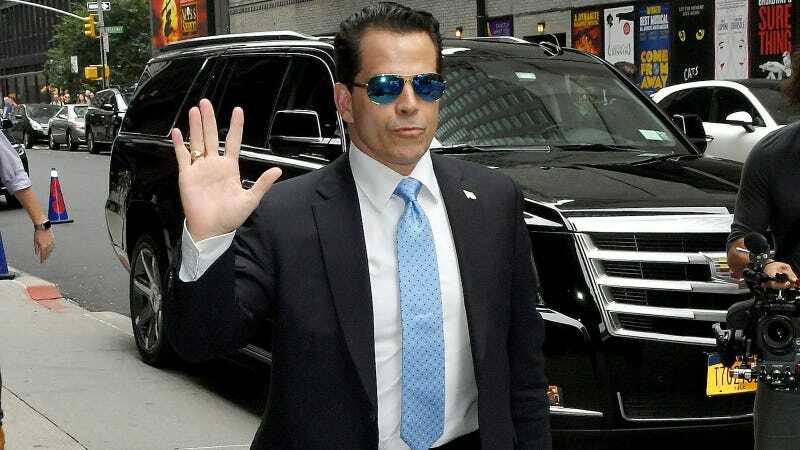 Q: What is the Scaramucci Post? Anyway, as far as I can tell, it’s a Twitter account and an Instagram account run by a former hedge fund guy named Lance. A: Lance is Lance Laifer, a 51-year-old ex-hedge fund manager from Long Island who was Taye Diggs’s “social media maestro” and is now apparently doing the same thing for Anthony Scaramucci, which is why both of them follow hundreds of thousands of people on Twitter. “I’ve always kind of thought of social media as a two-way device,” Laifer told GQ. Q: Does Anthony Scaramucci follow Ellie Shechet on Twitter? Q: Does he follow all of her coworkers? A: It seems like he does, yes. Q: Do follows = job offers? Q: What kinds of other stuff does the Scaramucci Post tweet about? Q: What team is the Scaramucci Post on? Q: How is their Instagram? Q: Does Taye Diggs still follow Ellie Shechet on Twitter, at least? Q: Is Lance Laifer a Holocaust denier or a troll or very dumb? Is he all three of those things? Q: Was Anthony Scaramucci upset about the Holocaust poll? Q: Is anyone getting fired? Q: Does more than one person work for the Scaramucci Post? A: It seems really unlikely. Q: Has society just fully broken down? Q: Is this the worst Twitter account? Q: What’s up next for Anthony Scaramucci?